So it’s been a while since my last post, but I have a good excuse! 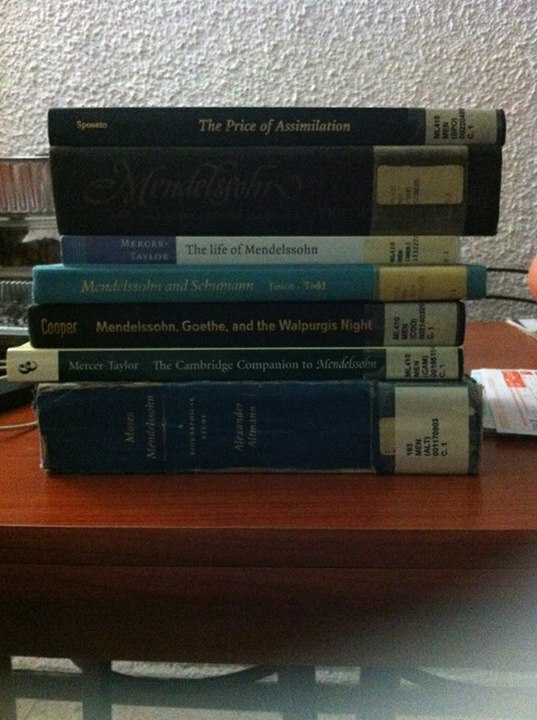 I’ve been busy (gasp). But hey, that’s part of my blog description. Last week was the annual Jewish holiday of Purim, which is kind of like Halloween but more religious and based on historical events. This holiday celebrates the fact that Queen Esther (a Jewess) convinced King Xerses of Ancient Persia to pass a decree allowing all Jews in the Kingdom of Persia to defend themselves against armies of Anti-Semites, who were allowed to hunt down and kill all Jews in said Kingdom by a previous decree passed by said King. The initial decree to kill all Jews was suggested to King Xerxes by his adviser Haman, who didn’t like Jews because we didn’t bow down to him and worship the ground he walked on (literally). Apparently that was something that was expected back in the day. But – Haman didn’t know that Queen Esther was a Jewess because she kept it secret. This was common practice in ancient times, because general sentiment towards the Jewish people were, and continue to be, mixed. So, Queen Esther invites Haman and King Xerxes to back-to-back private parties. I’m assuming she gets everybody loaded at the first one because nothing worth noting happens. At the second party she informs the King of the plot, and that Haman is behind it. To nobody’s surprise, King Xerxes gets pretty mad and sentences Haman to death by hanging, his 10 sons are thrown in for good measure, and then the Jews are granted permission to defend themselves against anyone who tries to harm them. The holiday is celebrated each year on the anniversary of the day that the Jewish people were meant to be killed. The name Purim comes from the Hebrew word “Lotteries”, as that was how the date of the massacre was chosen. As with many historical Jewish events, the moral of this one is: They tried to kill us, we survived, let’s eat. Food plays a big roll in Judaism, and not just because of the Kosher thing. Many of the holidays involve a food item that is central to the holiday; for example, matzah (unleavened bread) on Passover. 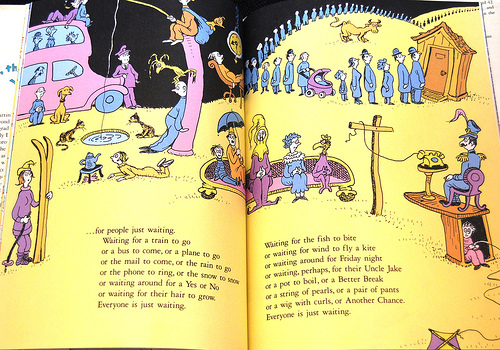 For the holiday of Purim, many of the events central to the story occurred at parties and/or feasts, involving copious amounts of food and drink. Additionally, before Queen Esther went to King Xerxes to plead for her peoples’ lives, she did not eat for three days, as a form of prayer to god to assist her. Naturally, this means that we eat a ton of food on this holiday. We also give gift baskets filled with food, drink, and home-made baked goodies to friends and poor people, because the core of this holiday is to be filled with joy. Joy that we are alive, and joy that such a miracle occurred. 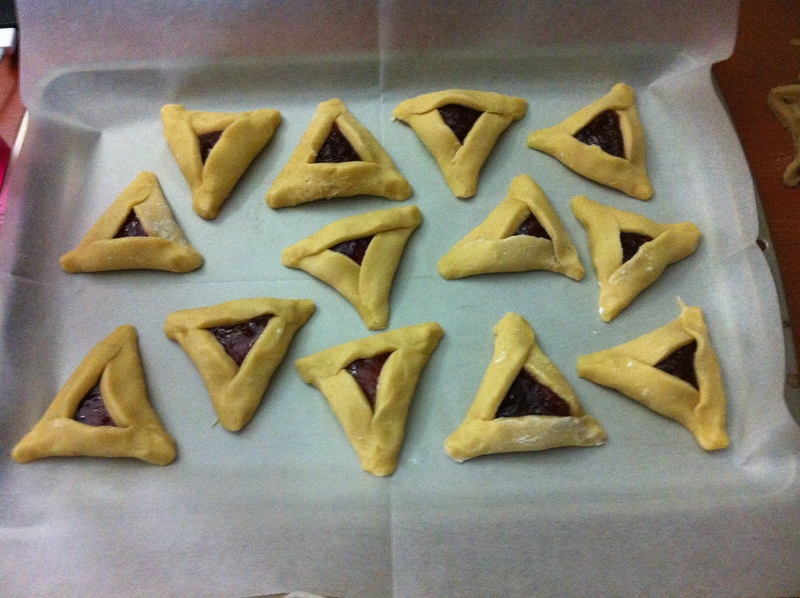 So, I present the most traditional of Jewish baked goods – Hamentaschen. 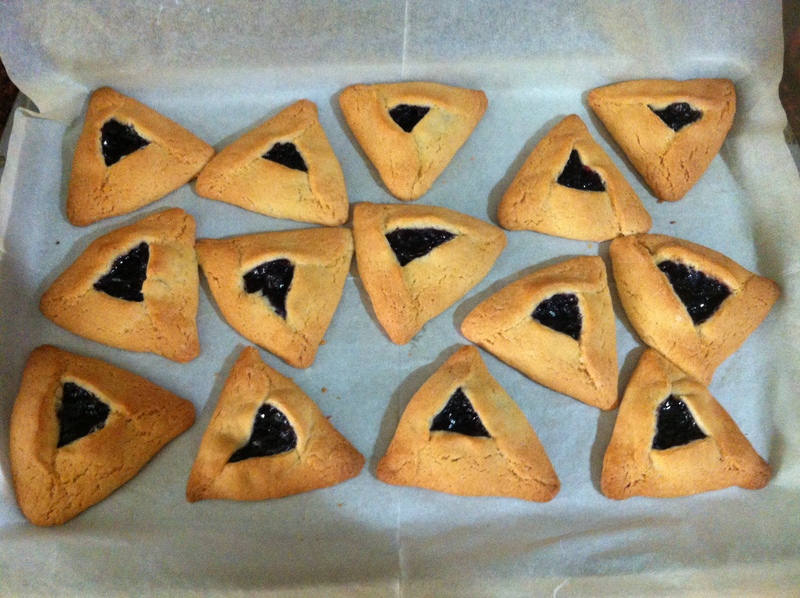 Hamentaschen; (Yiddish) – Haman’s pockets, Haman’s ears. I don’t know why. Just because. The finished product, with blueberry filling. These doughy goodies are traditionally filled with jelly of any flavor, poppyseed filling, or a spread like peanut butter or date. Alas, this year I went the traditional route even though I didn’t have an excuse. 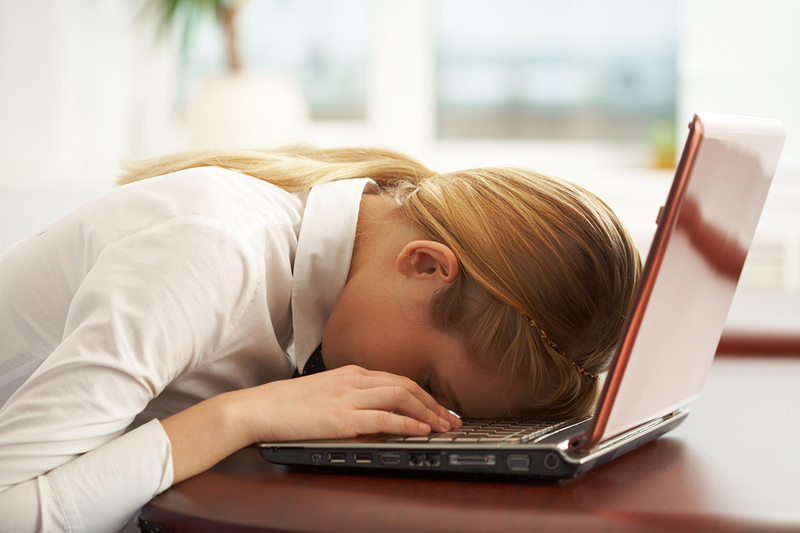 The hubby kind of put his foot down, but next year I’m gonna go crazy. As with previous years’ batches, I used strawberry, blueberry, and apricot jelly. I sprinkled a few with chocolate chips so the nooshkin would eat some, but for the most part we stuck to boring old jelly. I made the dough the night before and put in the freezer to help the ingredients solidify. The next morning, I removed the dough and left it on the counter for a few hours to thaw while I did (fill-in-the-blank; probably eat breakfast). After getting all my tools (rolling pin, cup, spoons, spatula, baking pans, parchment paper, flour, jelly, and chocolate chips) I was ready to go. I put on a Miyazaki movie and got to work. I tend to end up with enough dough for two trays of each flavor, which is enough for the gift baskets and a few extras to have around the house. Because the dough is pretty sticky, I used a lot of flour on the surfaces. All that extra flour gets into the dough, which is okay – the recipe only calls for 4 cups to compensate. The cup is used to make perfect circles in the dough, so the larger the mouth of the cup the larger the hamentaschen will be (and the less you end up with overall). 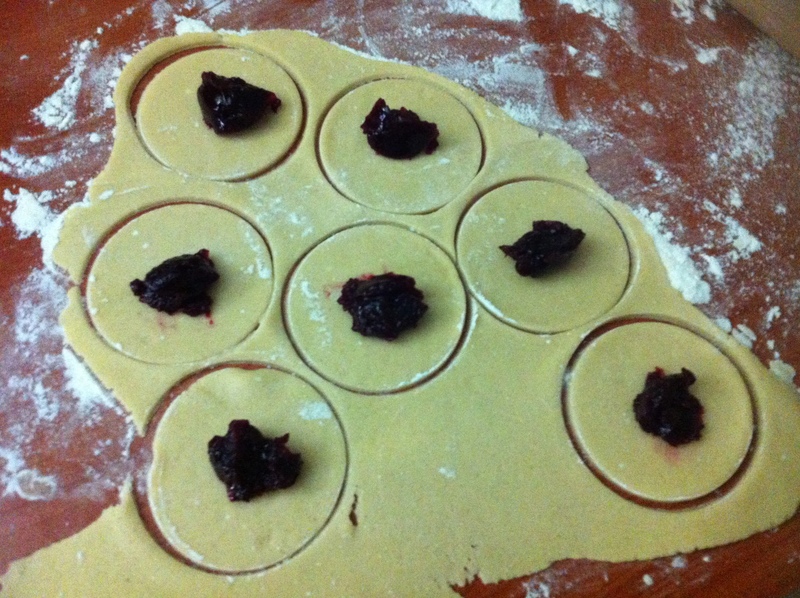 The spoons help with getting the jelly in the center of each circle of dough. I usually put in a full teaspoon, but again – the amount of filling/jelly will depend on the size of the cup you use (I use a cup that’s 3.5 inches/8.89 centimeters in diameter). After the jelly has been put in the center of the circle, the edges are gently folded up onto themselves to form a triangle. The tips are pinched together so no jelly escapes (but this happens anyway, especially in the first few batches while I find my groove). The spatula gets the prepared hamentaschen onto the baking sheet without breaking them. You can use a metal or silicon one; I have used both and there was no difference. This year, for the first time, I was actually able to use up all the dough – I usually have a tiny amount left over that I can’t do anything with, but not this time! The second-to-last one, with strawberry filling. The whole process including the baking took about two hours; and then I made another half-batch because why not? And, there is nothing more ego-boosting than tasting the raw dough after a whole year, and knowing it tastes just right. 1. Mix together margarine, egg, sugar, vanilla, and orange juice. 2. Add the flour, baking powder, and salt. Mix well, until everything is incorporated. — If you are preparing the dough ahead of time, you can cover the mixing bowl and put it in the freezer (for overnight) or in the fridge (for a few hours). Regardless, make sure to give yourself enough time for the dough to get back to room temperature before you start preparing the hamentaschen. 3. Roll out the dough on a floured surface to about 1/4-inch (0.63 centimeters) thickness. 4. Cut into circles, using the cup. 5. 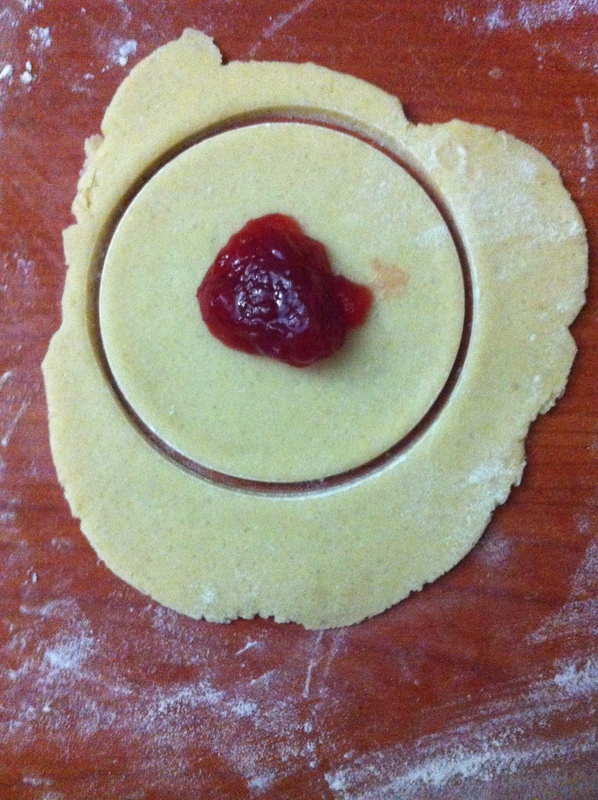 Fill the circles with the jelly or filling, and pinch the dough into triangles around the filling. 6. Place on cookie sheets or jelly roll pan. 7. Bake in the oven on 375 F (190 C) for 15 to 20 minutes until the edges are lightly browned.